HarassMap is an award winning volunteer-based initiative founded in late 2010. The HarassMap team and their projects aim to engage all of Egyptian society to create an environment that does not tolerate sexual harassment. HarassMap supports individuals and institutions to stand up to sexual harassment before or when they see it happen. By taking a collective stand against sexual harassment, re-establishing social consequences for harassers, and making role models of people who stand up to them, HarassMap believes that harassers can be deterred from harassing again. Front row, left to right. Mirna (design), Enas (HarassMap), Peter (design and data), Alia (HarassMap), Vaishnavi (data journalism). Back row, left to right. Friedrich (code), Ismail (design). HarassMap started collecting data when their co-founders were introduced to free software Frontline SMS and Ushahidi. They linked these together to create a reporting and mapping system that could be used online and through SMS. About 97% of Egyptians own a mobile phone, so this technology seemed created an opportunity to re-engage the public in the issue. 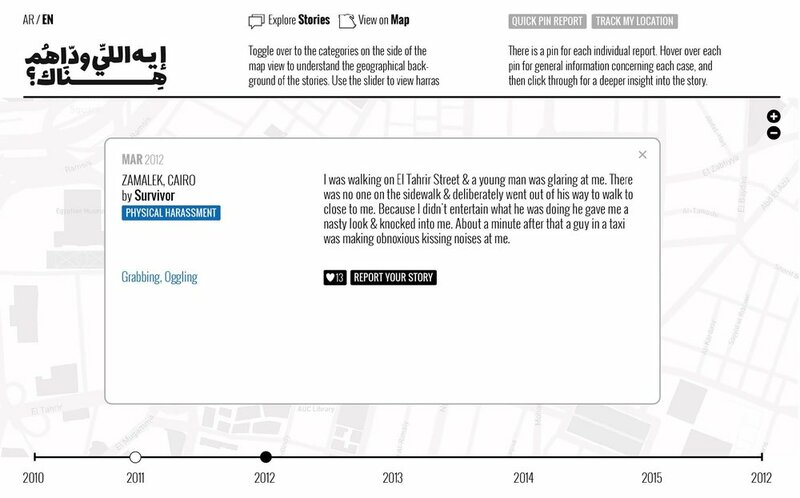 The dataset they brought to DATA4CHAN.GE was a crowdsourced archive of stories of sexual harassment in Egypt, and the locations where they occurred. The DATA4CHAN.GE HarassMap team worked tirelessly to create a swathe of product concepts for them to take home to Cairo, including a reimagined reporting tool, and a simple yet effective prototype for a data visualisation using the common threads from narrative experiences submitted to the platform. The data HarassMap brought to the workshop needed to be processed before it could be visualised. The incident reports themselves included some metadata that could immediately be mapped and charted, but the best content was trapped in free text fields. The team deconstructed the narratives submitted by Egyptians who had been sexually harassed in Cairo into three categories: setting, incident, and reaction. The working title for the piece was (translated into English) ‘What Were They Doing There?’, which called attention to the practice of victim blaming in Egypt. 99.3% of Egyptian women report being harassed. The HarassMap team's concept was designed around encouraging users to share their experiences, and to react to those already shared. With the emotive content locked in free text fields, the team weren’t sure how they could convey both the sheer volume of incidences and the individual stories of those affected. The team also proposed a new model for reporting and tracking sexual harassment in Egypt. The concept was designed around encouraging users to share their experiences, and react to those already shared. These screens show how the user is led gently from a passive reader, exploring the stories, to being encouraged to react and support those who have shared their stories, perhaps even becoming empowered enough to share their own experiences. There was a lot of information to bring into one screen, but in this case a map and timeline helped declutter multiple layers of information. A dynamic timeline-based map (web users manipulate the slider to view incidents across time) serves as an archive of events across the city, helping residents make decisions about which path may be safest to take, or which areas have become harassment hotspots.